Melt the butter in a large, deep stockpot or Dutch oven over medium high heat. Add the onion, carrots, and jalapenos and sauté until just beginning to soften, about 5 minutes. Add the garlic, salt, and cayenne pepper and cook until the garlic is fragrant, about 30 seconds. Sprinkle the flour over the top of the vegetables, then cook 1 additional minute until lightly golden. Slowly stir in the milk and cook until the mixture thickens, about 2 minutes, stirring constantly. Transfer the mixture to a 4-quart or larger slow cooker. Stir in the chicken stock, then add the chopped potato. Cover and cook until the vegetables are tender, 5 to 6 hours on Low. Transfer the soup to a blender or food processor and puree in batches until smooth (alternatively, you can use an immersion blender). Stir in the cheese a half-cup at a time, allowing it to melt completely before stirring in the next half cup. Serve garnished with jalapeno slices, green onions, additional cheddar cheese, and French bread. A hearty, cheesy soup with plenty of flavor and heat to warm you up on a cold night. We’ve arrived at that critical time of year – where winter feels like the bad houseguest who’s overstayed their welcome, but spring flowers and chocolate bunnies are eons away. 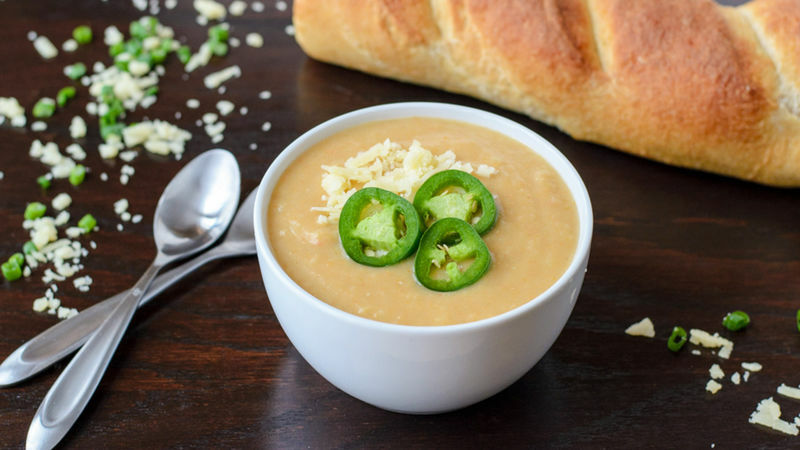 Warm and comforting with a kick, this Slow Cooker Jalapeño Cheddar Cheese Soup is the perfect remedy to beat the February blues. From December to March, I survive on soups. They’re easy to make, endlessly adaptable, and exactly what I need to fight the chill. By this point in the winter, however, I’ve exhausted my appetite for classic carrot and chicken noodle, and I’m ready for something new. To the rescue: Slow Cooker Jalapeño Cheddar Cheese Soup! The base of this soup is innocent enough: chopped carrots and potatoes, with Pillsbury Simply Rustic French Bread on the side for dipping. Two sneak ingredients, however, elevate the soup from “everyday warm up” to “take THAT old man winter!” Lots of shredded sharp cheddar gives the soup richness and body, and jalapeno peppers add a cold-busting kick. Making this soup couldn’t be easier. Let the slow cooker do all of the work. Bring on the blizzard – we have Slow Cooker Jalapeno Soup to see us through to spring!